The Infowise indicator field can be used to show a progress bar which dynamically updates to track spending. A progress bar is a useful tool to indicate progress towards an expected value. Create two standard SharePoint currency fields Spent and Budget set as required. Create an Infowise indicator field Spent %. Spent will be used as the numerator for the calculation. Budget will be used as the denominator for the calculation. 0 is the starting point for the progess bar. The calculated percentage is automatically shown as a progress bar in the user interface. 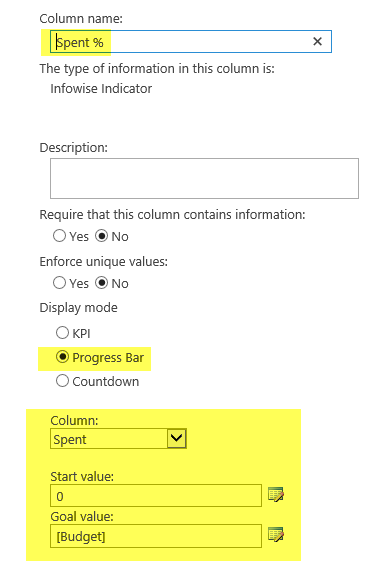 An indicator bar is often used to show progress towards an eventual goal. Consider using this to track sending or to show the progress towards completion of a project.